The holidays can truly be a special time for you and your family, but it can also be a busy time. The holiday season is coming up and when it does, things will move fast. You will have a lot on your mind between now and the beginning of January, and one thing you’ll need to keep track of is making your living space look great, particularly if you’re entertaining this season. Box&Co can help make holiday decorating easy, by giving you a place to store your decorations and allowing for easy retrieval, but we want to get you ready for everything that’s coming up over the next few months. Thanksgiving can be a lot of work, particularly if you’re hosting. But it’s important to understand that the presentation is just as important as the dinner. Some simple thanksgiving decorations can give you the feel for the fall season that you’re looking for. A centerpiece is the most basic, and the Spruce suggests using a vase filled with fall flowers and pinecones to pull off the look you want. Surrounding a centerpiece with small pumpkins also gives a wonderful ambiance or place a cornucopia on your table. But don’t just decorate your table. Put an autumn wreath on your door, or surround your entryway with pumpkins, gourds and corn shucks as well as ribbons with fall colors. Decorate your mantle and stairways with autumn themed garlands. Hanukkah arrives in early December this year and there are multitudes of things you can do with traditional decorations. HGTV says you can go non-traditional with a manzanita branch menorah that comes with holes that accommodate candles. A traditional Hanukkah toy that can also be used as a decoration is a dreidel. Martha Stewart recommends using them as place card holders or coating dreidels with glitter to use for centerpieces and garlands. Use the traditional colors of blue, white or silver in non-traditional ways, and consider using blue ornaments on a white tree to create a Hannukkah tree. There’s a lot of decorations associated with Christmas. There are trees, holiday lights, and displays like nativity scenes. If you are hosting a party or the family meal on Christmas Eve or Christmas Day, Real Simple has ideas for some simple ways to keep your home festive. For example, beautifully wrapped presents make for great decorations, so put them under the tree early. You can also hang the beautiful holiday cards you receive on your banisters. Hanging silver or white gift bows in front of your window can create the illusion of falling snow. In addition to hanging on trees, ornaments make wonderful centerpieces. Kwanzaa is a celebration that is centered around the seven principles of the holiday. There are symbols related to these principles, which include Mkeka, or the mat which is the symbolic representation of history and tradition. It serves as the centerpiece of your table, and because Kwanzaa celebrates creativity, Better Homes and Gardens suggests, making the Kinara. The Kinara, or candle holder is placed on the mat and seven candles, representing the seven principles, are placed on the candle holder. There are three red candles, three green candles and a black candle. Each child places corn on the table around the Kinara to represent our future. Baskets and bowls of fruit are also placed around the Kinara as are other gifts. As a symbol of unity called the Kikombe cha Umoja or the Unity Cup, this decorative piece is also placed on display. You can supplement your official decorating by employing the Kwanzaa colors of red, green, and black on tablecloths, napkins, and posters. Holiday decorations transform your home but sometimes they’re difficult to store. Box&Co makes storing and retrieving decorations easy. All you have to do is ask us for storage containers. We’ll deliver them to you. Once you’ve packed your decorations away, we’ll pick them up and when you’re ready to decorate for the holiday, we’ll deliver them back to you. Contact us today or email us @ info@boxnco.com for more information. 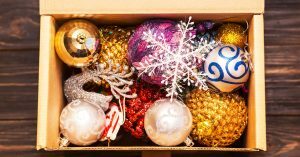 This article discusses how to prepare for the holiday season, with some helpful decorating tips and suggests using Box&Co to store decorations after the holiday season.